Making your baby part of your daily workout routine can be fun and can help to strengthen the bond you share. But it’s important first to learn when she will be old enough to have the neck, head and spinal control necessary to prevent injury, as well as how to choose a safe stroller designed specifically for the rigors of jogging with a baby. According to BabyCenter.com, your newborn has little head control because her neck muscles and motor skills are weak and undeveloped. As she grows stronger and works her muscles more, she will eventually be able to sit up on her own. She will also develop the neck and head control necessary for handling faster movement without the risk of damage to her spine or head. The age for these accomplishments will vary. Determining when your baby is developmentally ready to join you for a run is essential for her safety. Jogging strollers do not recline, so your baby will be sitting fully upright during your jog. Therefore, she must have full head control before it is safe for her to join you as you run. While many jogging stroller manufacturers recommend your child should be at least 6 months old, others recommend waiting until she is at least 8 months old to be sure, according to ConsumerSearch.com. Experts at Consumer Reports recommend waiting even longer, until your baby is 1 year old, because of the jostling involved and to prevent the possibility of suffocation due to her head falling forward and restricting her breathing. Talk to your pediatrician for guidance on when your 6- to 12-month-old is ready, to make sure your baby’s neck control is strong and she can handle the movement. Then do some research to find a safe stroller. Jogging strollers differ from regular strollers in a few ways, but most importantly, jogging strollers are designed to handle the speed and roughness your baby will experience while you jog on streets, sidewalks or other paths, keeping her secure and stable. 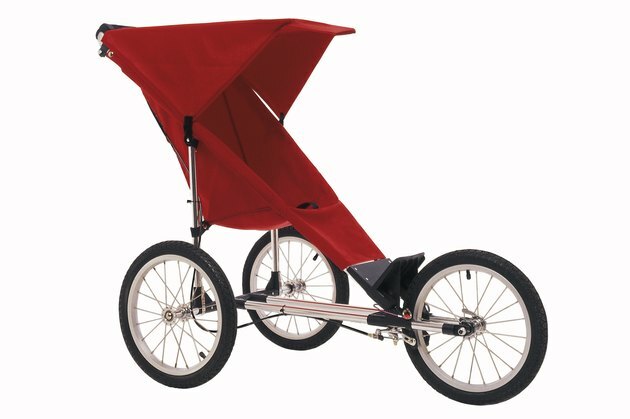 A jogging stroller is also different from an all-terrain stroller according to ConsumerSearch.com, and both regular and all-terrain versions should never be used for jogging as they are not designed properly for the type of movement involved in running and could lead to injuries for you and your baby. When choosing a jogging stroller, be sure to check for features designed to keep you and your baby safe. According to WhatToExpect.com, first make certain your stroller has the Juvenile Products Manufacturers Association seal assuring you it meets strict standards. Look for a fixed front tire that does not swivel, which allows your stroller to continue moving straight forward as you jog, and a five-point safety harness for top stability and security. Check for well-inflated tires, good suspension and effective shock absorbers, as well as features like hand brakes and a wrist strap to prevent the stroller from getting away from you on hills.